Sleek, clean and practical. You’ll get these characteristics and more when you choose Feldco for your steel garage door in Madison. Our steel garage doors combine the best of looks and functionality to give you the ultimate garage door. Feldco’s steel garage doors are more than just a slab of metal. We offer a wide variety of colors, panel options, window inserts, other hardware and garage door openers to help you craft the perfect garage door for your Madison home. Your garage is an important feature on your home so it’s crucial to have a matching garage door to maximize your home’s value and design. Madison homeowners have to deal with some pretty unpredictable weather throughout the year. In return, they need a garage door that’ll withstand anything thrown its way. Steel garage doors from Feldco are made from a thick, 24-gauge steel with options for a foam core insulation. When combined, these features create an ultra energy efficient garage door that’ll keep all your belongings protected from the weather. Plus, for homes with attached garages, you’ll save money on heating and cooling bills because your garage door won’t let in any outside drafts. Even with a detached garage, a steel garage door will protect your vehicles, lawn equipment and other belongings from Madison’s harsh weather. As mentioned above, our garage doors are made with thick, heavy gauge steel. It’s not a surprise that our steel garage doors are extremely durable. Unlike aluminum and wood, steel won’t warp, rot, crack, swell or dent when exposed to any weather conditions or other outside variables such as a stray baseball. 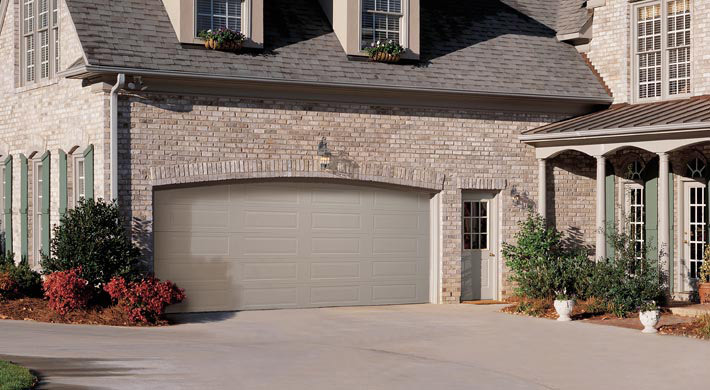 A huge perk of a durable garage door is the minimal amount of maintenance involved. Wood and aluminum will need to be taken care of very carefully to keep their looks. Steel garage doors only require a good cleaning every once in a while. There’s a few reasons why Madison homeowners trust Feldco for their steel garage doors. Things like premium products, professional installation and outstanding customer service are why over 350,000 people have counted on Feldco to get the job done.